Reading a building inspection checklist may not be the most exciting task on your to-do list. Fortunately, there is a way to make the process easier to get through. Start by separating the checklist’s content into two categories: mission critical data and secondary information. This one change will save you plenty of time, especially if you have a pile of reports to get through. To paraphrase George Orwell, some data points are more equal than others. There are two guiding principles that help you detect the most important information. First, look for extreme outliers that indicate problems (e.g. failed electricity tests or foundation damage). Second, look for the client’s “hot button” priorities. Let’s unpack the second principle further. Each client — and that includes managers — has different issues that concern them. If your client is upset with your assessment, then you have failed. For example, a client with a history of suffering through leaky foundations may be particularly concerned about foundation problems. In that case, you will want to spend extra attention on that point. What are the worst problems identified in this report? What are the top 2-3 issues that my client is generally worried about? Is there anything more to be learned from your building checklist after you have finished your first pass? Yes, there is more to be gained from these documents. To ease the process, let’s assume that you have your building inspection report in digital form. That means no more wasted time trying to decipher poor handwriting and dealing with missing information on your paperwork, saving you time. Secondary data on a building inspection checklist might include a comments section. In many cases, your field staff may leave the comments section blank. If there are comments, ask yourself a simple question to make sense of this information: does this confirm or deny “mission critical data” about the building? If the data in the digital inspection form is relatively unremarkable, briefly skim it and move on. Use a digital solution so that you can easily submit and read building inspection checklists. Analyze secondary data through the prism of outliers and client priorities. Step 3: Still Procrastinating on Reviewing Your Building Inspection Checklists? When Friday afternoon arrives and you have already read dozens of inspection files in the past few days, how do you summon motivation to keep going? Here are two quick ideas you can use to keep going and get the job done. When you are deeply in the weeds of property management building inspections, you might lose track of why this work matters. If you are inspecting homes, your work gives peace of mind to the buyer. You might save them from making a disastrous purchase. Alternately, your building inspection report will help them plan when and how to spend money on renovations. Without your expert assessment, the property buyer will always be filled with doubt. Set a quarterly reminder on your calendar to review your building inspection checklist. During this review, there are two points to consider. Are there new requirements you need to add (e.g. a new law passed by your state or city)? Are there any low value questions or items on the checklist that you can remove? Why make the effort to improve your checklist? It’s a simple document, after all. The value of keeping up with regulations should be clear — professionals stay up-to-date on laws impacting their work. But there’s more to the story than just staying current. Research has found that having a sense of progress at work boosts motivation. 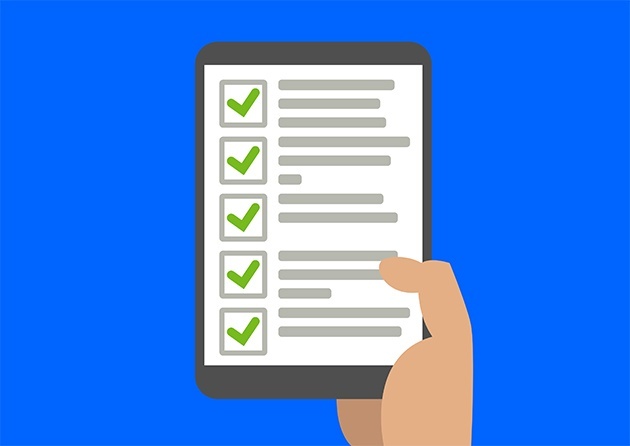 The Harvard Business Review reported in a 2011 article, “Of all the things that can boost emotions, motivation, and perceptions during a workday, the single most important is making progress in meaningful work,” and you can make progress by improving your checklists. If you get a few more small wins in your work, life starts to look even better. Tip: When in doubt, look for ways to remove items from the checklist. Gathering irrelevant or low value data will only make life harder for you and your staff. Reviewing your inspection reports and checklists easy with a mobile inspection app.